Earlier in the year, I realized that I spent far too much time checking my email and clearing out my inboxes each day. At the time, I had four active email accounts that I used and none of them worked terribly well with the devices that I wanted to check email on (other than my desktop). At the time, I had two Hotmail accounts (one personal, one business), an email account from DSU and a work email account from Factor 360 (Exchange 2003). Whenever I wanted to check my email, I had to login four different times and would always find myself greeted with spam and other email I’m not interested in (think email newsletters that I might have signed up for a decade ago). I was successfully using the “inbox zero” technique in my work email and my DSU email, but my two Hotmail accounts were a lost cause with thousands of emails sitting in my inbox. 1. Consolidate Your Inboxes – I took the four inboxes that I had and consolidated them all into a single Google Apps email address (matt [at] mattpaulson dotcom). All of the other addresses still exist, but I use Gmail’s pop3 email checking feature to automatically download mail from the four accounts I had previously been using into my single Google Apps/Gmail account. Switching to a Gmail/Google Apps account also provided an account which will work reasonably well on my mobile devices (Android phone, iPad, iPod Touch). 2. Declare Email Bankruptcy – After importing all of my email from my Hotmail accounts into Gmail, I found about 3,000 messages in my inbox. I had looked at most of them, but didn’t think it worth the time to go through emails (some of them dating back to 2002). As a result, I immediately pressed the “archive” button on all of them giving me a fresh-start and an empty inbox. 3. Use the “Exclusive Filter” on Hotmail – My two Hotmail accounts had receive a lot of spam and unwanted PR emails from people hoping that I’ll write about them on one of my blogs. As a result, I set the spam filter to “exclusive” so that only people that I approve of can actually send email to my Hotmail inbox, which is later picked up my Gmail account. Every week or two I go through the “junk mail” folders in my Hotmail accounts to see if there’s anything I missed. 5. Create a “Junk Mail” Label – Inside of Gmail/Google Apps, you have the capability to create different labels. I created a number of filters which move email that I have no interest in seeing immediately out of the inbox and into a folder/label “Junk Mail”. This includes notifications from services such as PayPal and Groupon, emails to “all students” at DSU and Sioux Falls Seminary and other emails that I should probably at least glance at, but have no interest in showing up in my inbox. Every couple of days, I take a glance at the “Junk Mail” folder to see if there’s anything worth looking at. 6. Use Unsubscribe.com – Unsubscribe.com is a freemium/paid service that adds a one-click “unsubscribe button” into your inbox (works with AOL, Gmail, Yahoo, Hotmail). Whenever you get a newsletter or a group email that you want to go away forever, you click the “Unsubscribe” button, and the service is smart enough to take that email and follow whatever steps are necessary to unsubscribe you from that mailing list. Using Unsubscribe.com has dramatically reduced the amount of unwanted “not-quite spam, but almost” email that I have no interest in seeing. The service works reasonably well, but there have been a few times it hasn’t worked. 7. 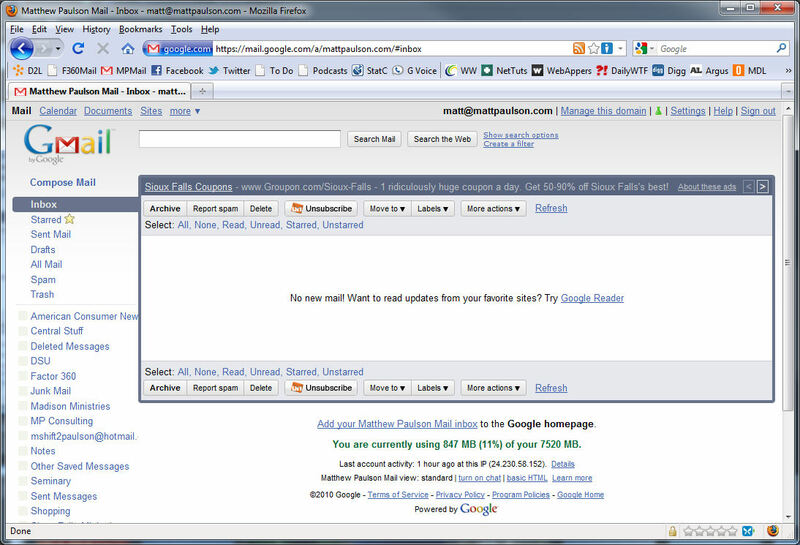 Check Email Less – I had previously used notification tools such as Google Talk to tell me when I had gotten an email. I found myself reading every email as it came in, dramatically reducing my productivity. I have since turned those tools off and moved to checking my email a few times a day and working through email only when I choose to check it. 8. Practice “Inbox Zero” – After getting my email in order (this was about six months ago), I stood resolved that I would make use of the “Inbox Zero” techniques promoted by Merlin Mann of 43 Folders. So far, I’ve been successful at keeping my inbox empty. Although it’s hard to measure quantitatively how much less time I spend checking email on a given day, I’ve found that my daily email grind has become much more manageable. Some say ignorance is bliss. I say, an empty inbox is bliss.